UDM Downloads > Glory Zone! Glory Zone is a 3D arcade style space shooter with an integrated mp3 player. Highly addictive game. 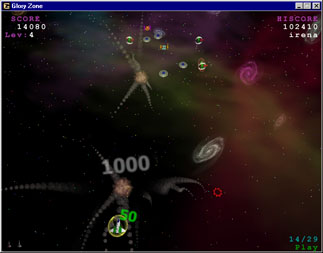 It has 40 levels, 11 different enemy ships with unique attack patterns, several power-ups, nice explosions with long smoke trails and beautiful moving nebulas and rotating galaxies in the background. You can put up to 50 of your favorite mp3 songs into the music player's playlist and listen to them in random or sequential order while playing the game. Glory Zone has 3 levels of difficulty with separate hiscore tables. In unregistered version you will be able to play only the first 8 levels and none of the game settings will be saved. The game needs 3D card with OpenGL.